An amazing evening altogether. Former PDG Fred West whipped up a truly memorable event for the Belmont and Redwood Shores community, a Lobster Festival dinner, live and silent auction, dessert auction, raffle, bar, Interact Peace Project and presentation of an automobile to a worthy disabled U.S. Marine veteran, with fellow Marines in attendance. For the full story, click "Read more.." below. 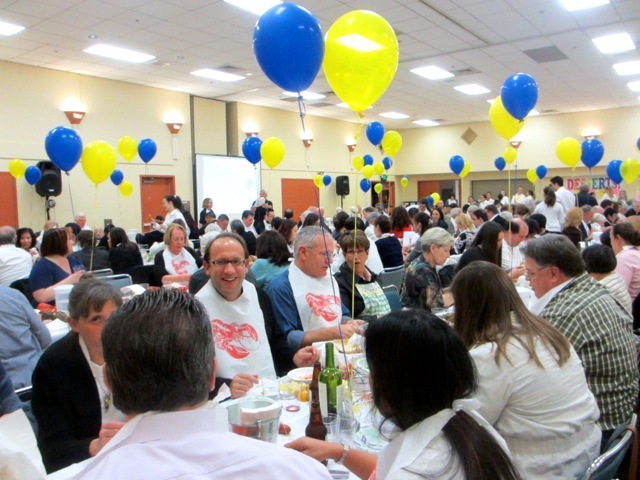 For 18 years our Rotary club had proudly presented the Crab Feed, a community dinner to develop the funds needed to carry out the programs our club has provided for our service area. Then, days before crab season was set to start, the California Department of Public Health began warning people not to eat crab caught along the California coast. Why? Potentially deadly levels of domoic acid – a naturally occurring biotoxin – had been found in Dungeness and rock crabs caught along the coastline between Oregon and the southern border of Santa Barbara County. This problem led PDG Fred West, this year's "Chief Crab" to consider alternatives. 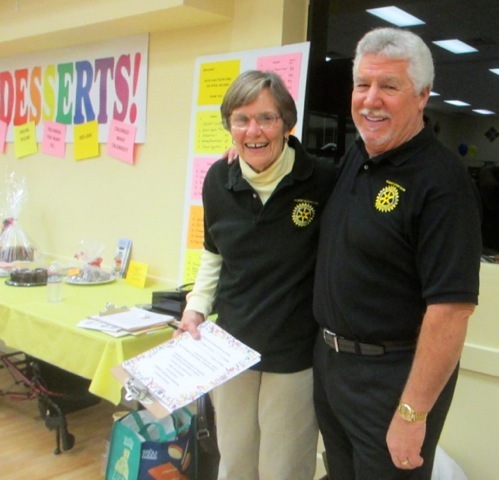 By coincidence, he had been thinking about lobster as an alternative and had discussed it with this year's club President Jack Murray as early as February 2015. The bad news about crab put Fred into hyper-action mode and he came up with a new plan, involving entering into an agreement to use (for the first time) a caterer for much of the dinner: the New England Lobster Co. 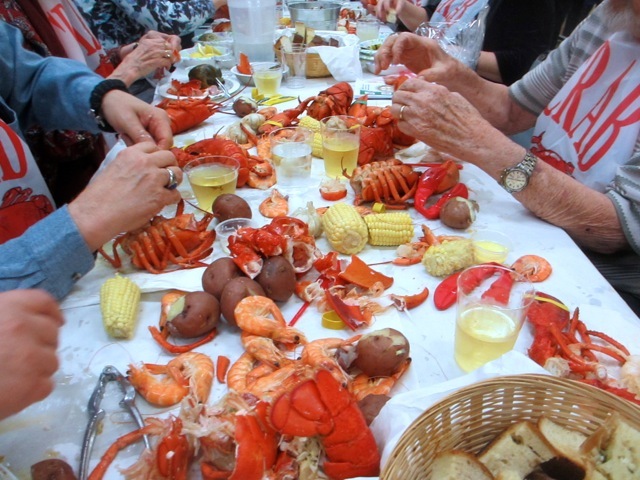 Since the club had been giving a reconditioned car away to deserving disabled veterans for a number of years, it also was Fred's idea to combine the "Cars For Vets" presentation with a Lobster Fest. 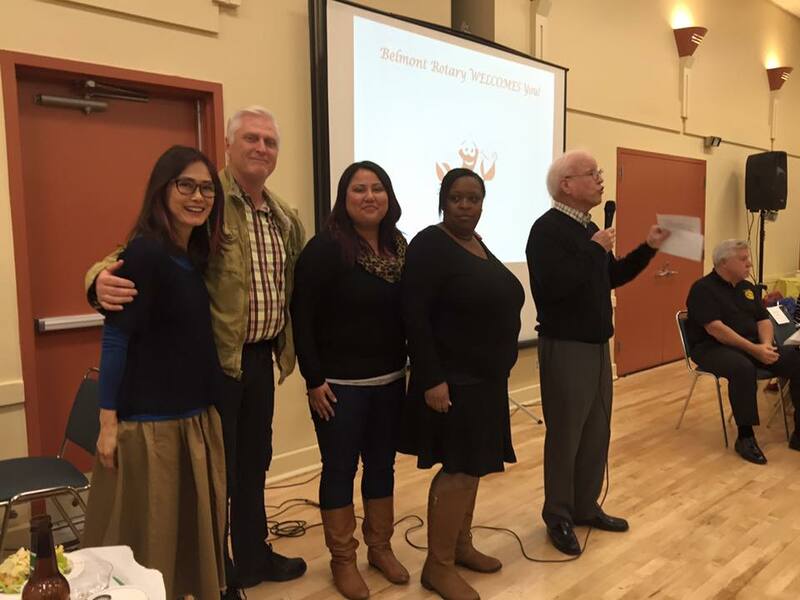 Then, at the suggestion of club treasurer Karen Haas-Foletta, we also added presentation of the club's $3000.00 check to Footsteps Child Care to provide subsidies for fees and tuition assistance to the families of children who need, but cannot afford, after school care in the Belmont and Redwood Shores communities. This was becoming quite a project, but the club truly came together to make this a very memorable evening. 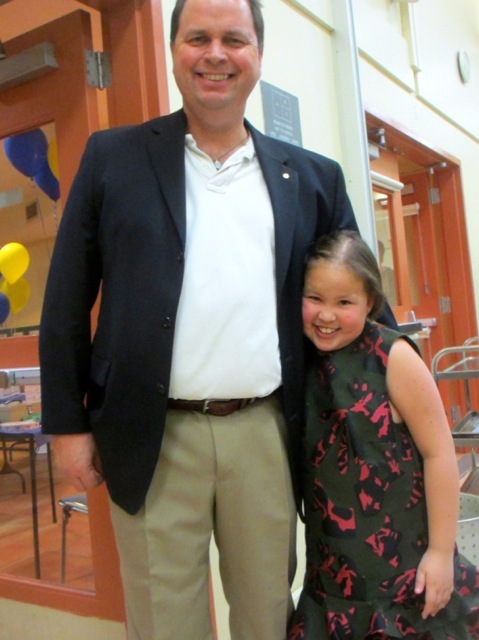 Lobster Fest chairman and organizer extraordinaire PDG Fred West and Amber Resnick. For a number of years our club's "Cars For Vets" program has been giving one or two fully reconditioned cars or other transportation to disabled veterans, and this year we are trying to increase the number. The cars are donated, and the work also is donated (through the leadership of Chris Zammit of Summit Auto Body of Belmont). The funds for all of this are provided by the club. Tonight, we presented a beautiful silver 2005 Hyundai Elantra to Marine Corps corporal Jerry Thimot and his wife Melissa. Jerry is still receiving active medical treatment, and the car will be of great help to him in making his appointments at Stanford University Medical Center. President Jack Murray presents the car keys to Jerry and Melissa. More than 200 people stood together to show their solidarity with the corporal and his wife and to demonstrate their willingness to help. James Brown, in the black shirt, finds the veteran who needs assistance and gets the ball rolling. Marine Corps Staff Sergeant Jose Banda looks on proudly as the keys are given. Also present were Marine Corps Captain Melanie Clifton and Sergeant Major Larry Liechty and his wife. So proud of all of them! Footsteps Child Care staff are ready for the check as President Murray explains how everyone who helps the auction also helps the children who are in need. The silent auction tables arranged by Karen Haas-Foletta beckon, while her son Nick prepares the computer back room to ring up the receipts. Footsteps Interact, all dressed out in purple, prepare to guide auction buyers to the tables. Wes Won did all of the multimedia presentations for the live auction. Auctioneer? 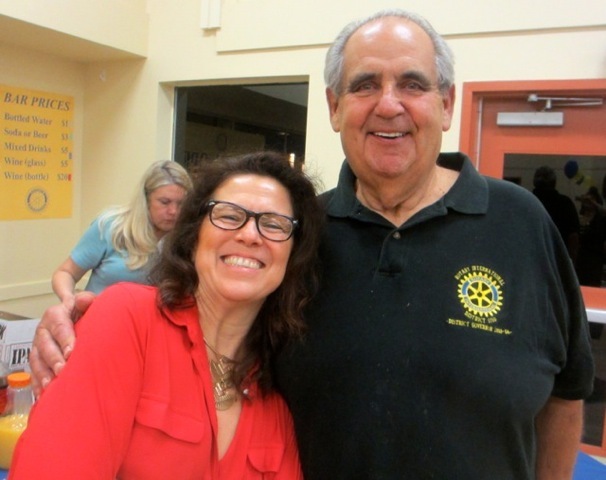 Tom Diridon (seen below with Sharrie Kriger, chef-de-dessert), of course! 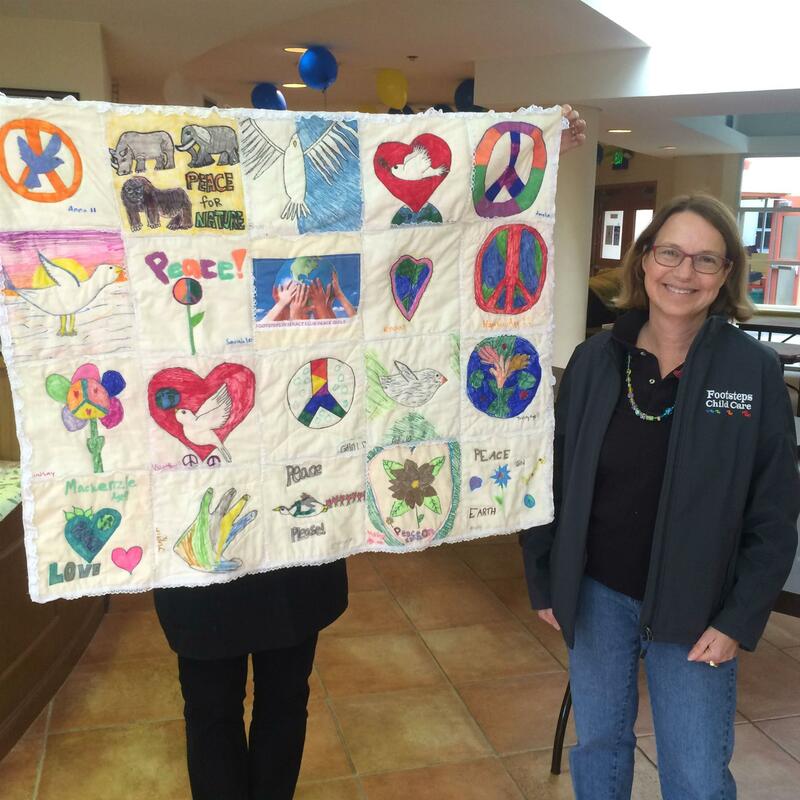 Footsteps Interact Club made this Peace Project quilt, each team member contributing at least one square. The quilt and art work made by the Interacters were put up on auction, and everything sold. Proceeds went to the Interact Club and to its members. Dennis Pettinelli (investment advisor) sold the raffle tickets and Mike Telleen (lawyer) sold the drink tickets. Hmmmm, could there be a relationship? Marie Murray sort of liked the idea of investing in glass bottles. Not inside them; in them. John Rossetti and Gail Rossetti poured generously. 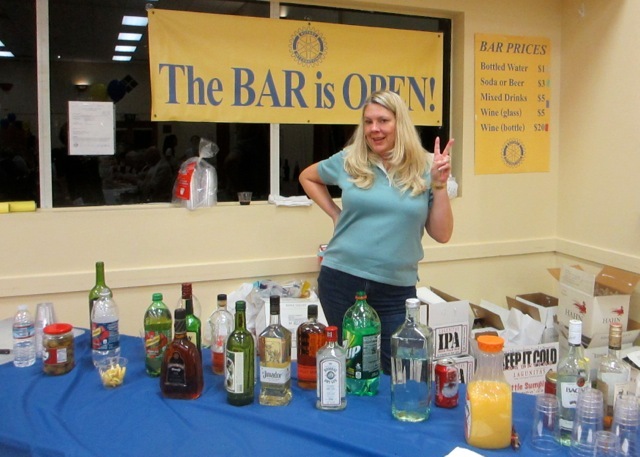 Joanna Reams handled the bar while John and Gail Rossetti took a break. Hey, where is Geoff Wiggs? Oh, there's Geoff with his beautiful daughter! 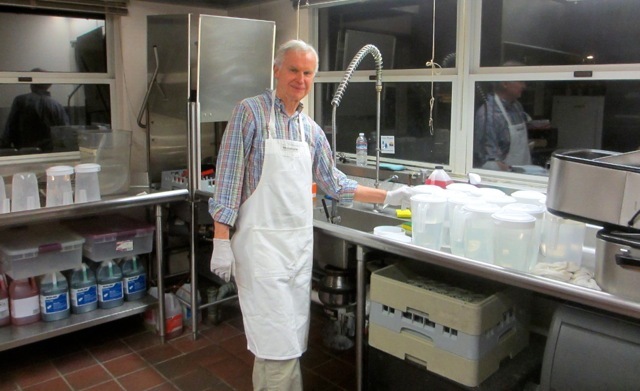 Someone had to do the dishes, and even though everything was plastic Chuck McDonald kindly offered to help! And last but by no means least, Carlmont Interact helped everywhere.